Doctors are supposed to be the epitome of health, a shining example of how to live your best life... or at least a shining example of how to exercise restraint in plastic surgery. 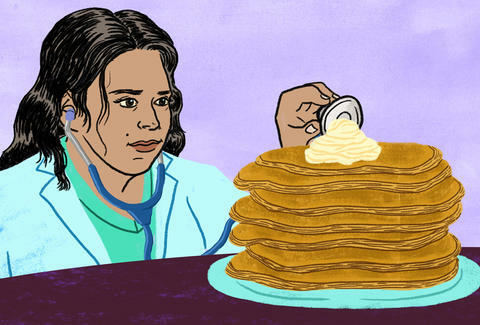 Since breakfast is the most important meal of the day (allegedly), it would make sense that doctors start their mornings off with the healthiest, most nutritious choices, right? Not always. Doctors are human, after all! Though most try to stay healthy, they still work crazy hours in stressful jobs, and sometimes convenience takes precedence over nutrition. Here's what 29 MDs told us they eat for breakfast. Do I recommend this to my patients? No, but doctors are the worst patients. "I eat all kinds of things for breakfast, but they're not always healthy: Greek yogurt with bananas or granola or flax seeds, Cheerios with molasses, Quest power bars, or a whole-wheat English muffin with a variety of toppings." -- Dr. Natasha Bhuyan, family medicine and provider at One Medical. "I like eggs, and they happen to be chock-full of vitamins, minerals, and healthy proteins, and amino acids. On my days off, when I have an extra minute to cook, I will make an omelet with two organic egg whites, 1oz of organic milk, stirred, salted, and lightly fried with some coconut or olive oil. Some days I will cut some scallions and a strip of red pepper into my omelet, or on other days I prefer to add an ounce of Vidalia onion with four to five grape tomatoes and dill. Either way, I typically top the almost-ready omelet with a pinch of organic mozzarella cheese." -- Dr. Svetlana Kogan, author of Diet Slave No More! Christina Stiehl is a Health and fitness staff writer for Thrillist. She's now going to start having a variety of donuts and flavored milkshakes for breakfast. Follow her on Twitter @ChristinaStiehl.